Ama Dablam's South West Ridge is one of the most aesthetic climbing routes in the Himalaya. It is renowned as a 'must-do' for any committed alpinist, with an exposed rock ridge, dotted with towers and intricate climbing leading from Camp One to the summit ice fields. Accentuated with outrageous exposure the route offers spectacular views of the Everest Massif - the panorama, if not the altitude, will take your breath away. The Ama Dablam South West Ridge expedition is befitting for technically oriented climbers but is never extreme. You need good mountaineering skills, some altitude experience and an adventurous attitude. On the final day of the climb, the route follows steep snow and ice slopes, accentuated by outrageous exposure directly to the summit. A non-refundable deposit of US$1,000 is payable to secure a place on the expedition. The Expedition Trip Notes provide detailed information and background for Adventure Consultants' Ama Dablam Expedition. The team will have a minimum size of 3 members and 1 guide and a maximum size of 6 members and 2 guides. Two or three climbing Sherpas will assist with the load carrying on the mountain. The expedition leader is generally scheduled approximately six months out from the trip start. All of our trip leaders have extensive experience at high altitude and a proven record of safety, success and compatibility. The number of guides is determined by the team size but the normal ratio of guides to members is 1:3. You will find our guides companionable and strong expedition members with considerable power and willingness to see you achieve your goals. The expedition leader for our 2018 Ama Dablam expedition will be Mark Austin. Mark began his climbing career at the age of 20 and led a successful expedition to Ama Dablam in 2008. His most recent expedition was to Island Peak as an AC guide in the 2018 pre-monsoon season. Mark is a fully qualified IFMGA Climbing and Ski Guide. Our 2018 Assistant Guide for the Ama Dablam expedition will be Alex Geary. Hailing from Australia, IFMGA Guide Alex has climbed and skied all over the world, including Europe, Alaska, Thailand and South America, as well as in New Zealand for Adventure Consultants. His people skills make him a popular guide and a welcome addition to any trip. This climb is not for novice mountaineers. It will require members to be comfortable ascending and descending steep terrain on fixed ropes. A high technical standard is not mandatory because primarily the guides will be leading the climb and fixing the route. However, this is not a mountain to visit and then discover that you are not comfortable with exposure. We suggest that you gain experience and the required skills for travel on exposed technical ground before joining this expedition. Membership will be restricted to climbers with a proven list of alpine ascents. A high standard of fitness is expected. It is advantageous to be able to move over rocky terrain efficiently. We have the luxury of a strong Sherpa team that will carry all the team equipment, food and ropes on the mountain. Whilst there are some instances where the Sherpas will take a couple of small items for you to the next camp, this is only occasional and you are expected to carry your personal gear. When you put all your gear into a pack it still amounts to between 18-25kg so the load is not insignificant and you must come prepared for the high level of physical output. This reinforces the need to take just the right amount of equipment with you on the mountain and to ensure you are ‘pack fit’ before you arrive on the expedition. See our Fitness Training Programs for information on how we can help you prepare for the expedition. We climb Ama Dablam via the SW ridge, a technical route, and considered to be the standard route. The route is considered a relatively safe route by Himalayan standards. It is a varied and interesting route with loads of superb climbing on snow, rock and ice. On Ama Dablam, the hardest pitches of technical rock and ice climbing are not sustained but tend to come in short manageable sections, all with ropes fixed in place. One of the most energy absorbing activities, if not done properly, is ascending a steep fixed rope. Getting specific training in this area is important for not wasting energy at altitude (it’s hard enough at sea level). By practising at a local cliff or climbing gym you should be able to get all your lengths of leash attachments right and fine tune your technique. Other skills specific to Ama Dablam include travelling along rocky ridges in your plastic mountaineering boots, camping in the snow, repelling/abseiling and general mountain movement, which can be difficult if you live in a city. Above all, have fun, enjoy the people around you and marvel in the spectacular environment you are in! Ama Dablam was first climbed in 1961 by a New Zealand and American team, and we follow their same route, the SW Ridge. A six-day trek into base camp (4,529 metres) via the Khumbu Valley provides great views of Ama Dablam and we experience some of the culture and hospitality of the Sherpa people. The well-trained Sherpa cooks prepare high quality ‘western’ food as well as popular Sherpa dishes in the Base Camp Lodge. On the mountain your guides will cook and a team environment means all efforts to assist with collecting snow for melting water and other meal preparation tasks will be much appreciated. Please indicate any specific dietary requirements you may have on your application form. Expedition members will be sent a list detailing all necessary individual clothing and equipment to be provided. From Kathmandu, we fly by helicopter or fixed-wing plane directly to Lukla and follow the Khumbu Valley to Namche Bazaar. Acclimatising along the way and relishing in the hospitality provided by our Sherpa friends, we reach Base Camp (4,529m/14,859ft) and after some rest and preparation, we begin the ascent. Base Camp is now at a comfortable high altitude lodge where the meal preparation is supervised by our Sherpa cooks. AC import a lot of high-quality western food to supplement the local produce available. Once established in Base Camp, we move loads to Camp 1 (5,807m/19,052ft) via a long slope to the beginning of the SW Ridge proper. This is where the technical climbing begins and the route follows the spine of the rock ridge leading directly to the Camp III (6,277m/20,594ft). The very exposed nature of the route makes for exciting climbing, yet the climbing is not as steep as one would imagine. Climbers with moderate technical experience can attempt this route. 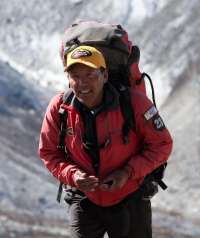 The guides and Sherpas will fix the rope on the route and stock the camps with provisions and equipment. Two or three Climbing Sherpas will assist with the load carrying but no more will be engaged in order to avoid clogging the route and spoiling the nature of the climb. When the fixed line is in place and the two camps are established and stocked, we will climb back up the ropes and make a bid for the summit. On summit day, the route weaves between the ice cliffs then follows a snow arête directly onto the 6,828m/22,401ft summit. We are renowned for the quality of service and strategy applied to our expeditions. Our reputation is attributed to the meticulous planning and logistics coordination done by our head office. Once on the ground in Nepal, you can expect to be well looked after by our guides so that you can relax and enjoy climbing in this amazing country. I hear that Ama Dablam is very technical and after seeing pictures I am wondering, how is it climbed? Yes, Ama Dablam is more technical than most of the other climbs that we do. Above Camp 1, we are on fixed ropes moving over technical terrain for the rest of the climb. We are often 'clipped in' while moving around Camp 2! The route we ascend is the Southwest Ridge, which is the standard route on the mountain. We also offer a trip that ascends the highly technical North Ridge of Ama Dablam. Please contact our office for further information on this route. You must have completed at least a basic rock climbing course, and have had exposure to altitude above or near 20,000ft/6,000m. You need to be in excellent shape for this climb. Due to the technical nature of the peak, it is critical that you are in the best shape possible. Also, as Sherpa support is moderate on this climb, you are expected to be able to carry all of your personal gear needed for the climb. The Sherpas will primarily be responsible for transporting our group gear. We will move our personal gear up the mountain in stages, but typically our packs are 30-60lbs/14-28kgs. The distances vary from camp to camp, but you can expect days usually to last 4 to 8 hours. Some say that summit day is the most straightforward day of the whole climb! It is the one day of the climb where you are totally on ice and snow with no rock. It is a longer day than most, but very straightforward. Expect a summit day of anywhere from six to twelve hours. We stay at the Hotel Radisson in Kathmandu. Only 15 minutes walk from the tourist centre of Thamel, the Radisson is situated in a quiet location and boast a fitness centre, sauna and steam room, three restaurants, a bar, café and a rooftop swimming pool! A perfect place to begin and end your trip. We offer shower facilities on all our high altitude expeditions and these will be made available as often as possible. During the trek in, many lodges offer hot showers for a fee and while at Base Camp, we will often set up a dedicated shower tent. We advise people to bring wet-wipes for impromptu washes in between available showers. Most days in Base Camp also start with a 'hot towel' delivered to your tent or dining table. You’ll get breakfast, lunch, dinner and snacks, as well as ample hot and cold drinks. We can cater for vegetarians as well as many other special diets as long as we are informed of this prior to the trip. All of our expeditions provide excellent local and Western food! If you have any special treats that you like, we encourage you to bring some along. When staying in the lodges, expect hearty fare such as yak steak, local favourites like dal bhat and Western-style dishes such as pizza. When in Base Camp, our well-trained cooks prepare high quality Western food as well as popular local dishes - don't be surprised to see sushi, nachos and pad thai on the menu as well as Kiwi bacon, cheese and salami, fresh coffee and yoghurt. Please indicate any specific dietary requirements you may have on your application form as we are happy to accommodate those with specific diets. We book tidy, clean, modern lodges - the best that are available in each village. They are well-known locations to us and we have a good relationship with the lodge owners. We can book private rooms for you if that is a preference at an added cost. Our standard trips are based on shared rooms, usually twin-share and sometimes triple-share. On the mountain you will share a tent with one, or sometimes two other climbers. No, our trip programmes all have an arrival day and a departure day built into them. Please plan to arrive before 3pm on Day 1 of the itinerary. You are welcome, and encouraged, to arrive a bit earlier to explore Kathmandu if you have the time. Before your expedition you will receive a “final details” letter. This will let you know the time and place to meet your guides. An AC representative will meet you at the airport and the first of many team briefings will take place on the evening of Day One. Please do not book to depart before the scheduled final trip itinerary day. 'E' tickets are the standard practice these days and are now acceptable in Kathmandu. Do ensure that you print your itinerary and have your booking number with you, as this allows our local agents to assist with changing your return flight plans if need be, while you are in the mountains. Generally, we ask you to wait until 90 days prior to your trip start date to ensure your trip has met the minimum numbers and will operate. If you see a good deal and want to book your flights, then ensure that you can make changes to your ticket or you run the risk of losing it if we do have to cancel the trip. In such situations, we are usually able to help you book on to an alternate departure, either with us or another operator. The problem with these tickets is that you usually end up having to pay quite a lot more if you have to make any changes at a later date. Some of the places we go to aren't straightforward and we highly recommend using a travel agent for such travel, as there are many intricacies that they can help you with. In the long run they save you money! We use professional travel agents for all our staff and guides' travel bookings. Yes. For most nationalities, a visa can be obtained on arrival into Kathmandu or can be issued prior through an online system. Upon arrival, be sure to have the correct USD amount in cash for your visa application and have a passport photo ready. Currently, a 40-day visa costs $40 and 90-day visa costs US$100. Do make sure that your passport has at least six months validity and more details on this process are included in your comprehensive set of Reference Notes, which will be emailed out to you upon sign up. Once we have received your booking form and deposit, we will email your Team Reference Notes which offer an assortment of information including detailed equipment lists. Any questions you have after reading through this can then be directed to our Equipment Coordinator, who can assist you in preparing for the trip as well as recommending and sourcing a range of clothing and equipment suitable for the climb via our gear retail service. What altitude medication will be available on the expedition? Do we need to take tablets before/ during the trek? How many guides/ Sherpas will be assigned to our group? Yes, this is possible on some of our expeditions. Please enquire directly with the Adventure Consultants office. We are happy to arrange a private group trip and we have run many successful private trips and expeditions including summits of 8,000m peaks such as Gasherbrum 2 and Kanchenjunga, all of the Seven Summits and remote destinations such as Antarctica. Some clients enjoy the added privacy and schedule flexibility that a private expedition allows, so you can hike and climb at your own pace and enjoy the mountains on your own terms. There is no specific group size, but obviously larger groups are more cost-effective. Please contact the office for more information. We cannot recommend enough being fit prior to the expedition as this will make all the difference to your success and enjoyment. You should be comfortable climbing at altitude while carrying a pack for 4-6hrs on most climbing days. Summit day will be longer, often 10-14hrs. Contact us for specific advice regarding training for your climb or visit our Fitness Training Programmes page. We have specific ideas around training and great book suggestions to help you along. Please look over our Fitness Training Programmes for details. If you require more information please contact our office and we will be happy to put you in touch with one of our senior guides for a consultation and we can also link you with our training coach to design a training programme for you. Yes, most of our expedition guides take satellite phones and you are welcome to use these at US$3 per minute. Most often, your guide will post daily dispatches on the AC website where your friends and family can follow your progress. We receive regular updates from our guides while they are in the field so the best place to reach a loved one is through our office. At the Base Camp we will also have a 12V electrical re-charging system, so do bring 12V car chargers for any electrical items that you wish to recharge. We cannot charge items in Base Camp that do not have a 12V cigarette lighter adapter, so please check that your accessory takes batteries or can plug in with a 12V cigarette lighter charger. We can cater for special power requirements at an extra cost or advise on the purchase of a suitable personal solar charging system - please enquire with our office. During the trek in, many of the lodges also have power available with typical Asian plugs (two nail-like horizontal prongs) and offer recharging for a fee. Yes, it is very important. Many of our expeditions are in remote places with no roads and third world medical services. In the unlikely event you get sick, you want to get to good medical care ASAP. Coverage varies based on your nationality and the trip that you are taking with us. When you have booked on for a trip with us, we will send you comprehensive information on various insurance options which will serve as a good starting point for obtaining the best coverage available for yourself. We recommend to all our expedition and trek members to buy trip cancellation insurance upon sign up for your expedition or at the very least, at the same time as you pay for your flights (and the balance payment) for the trip you are going on. It is very important to buy trip cancellation insurance (in addition to your evacuation and comprehensive travel insurance) as it is not unknown for people to have unforeseen circumstances that force them to cancel their trips for reasons such as family illness, injury to one’s self, business issues, etc. Each specific trip page on the website has a section as well as a downloadable pdf document with exactly what is and what is not included on the trip. International airfares are not included in the trip price. We can however recommend excellent travel agents whom we have worked with in your country should you require help with arranging your international airfare. Many of our trips are very similar in price to our competitors. Some companies even wait for us to set our prices and use ours as a guideline!! Some of our main selling points, which sometimes do cost more are; internationally qualified western guides, proven dependable local operators, small group sizes and safe guide-to-client ratios, quality equipment and high summit success rates, among other things. You do get what you pay for which is why we stand out from the rest. Many clients come to us after failing on one of our competitors ‘cheaper’ trips. The best way to reserve your space on a trip is to call our offices or complete our online booking form. Return this with the trip deposit either through a telegraphic transfer (information is on our trip notes downloaded from the specific trip page) or by using our secure credit card page. Phone our New Zealand head office on +643 443 8711 (Monday - Friday, 9:00am - 5:30pm PST + 19 hours) or Freephone 1-866-757-8722 from North America. The overall leadership was excellent and got better when we got to the business end - on the mountain, our guide’s management of the group and the Sherpas was nothing short of excellent. Not one time on the trek or the climb did I watch another group with envy. We were always the better equipped, better cared for, safer and happiest.